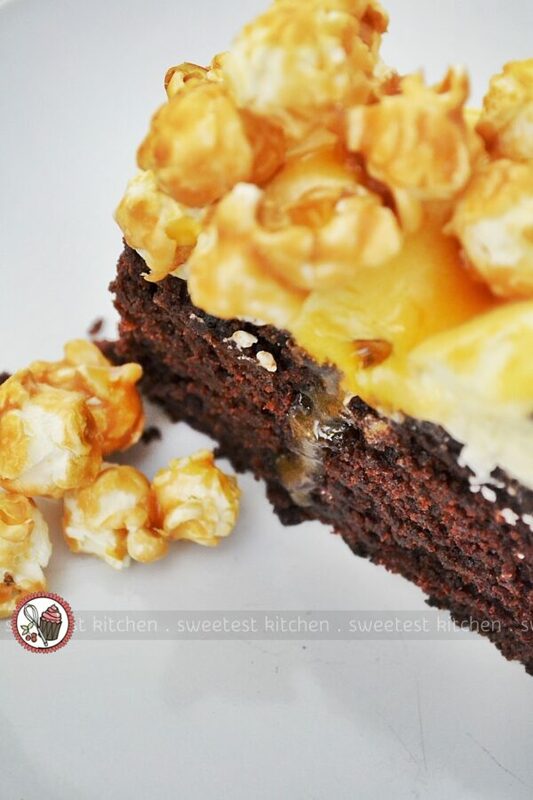 A super easy and quick way to dress up a plain chocolate cake – with whipped cream, caramel sauce and caramel popcorn! Delicious and impressive! Happy 2017! I’m starting off the new year with one of the easiest cakes ever! 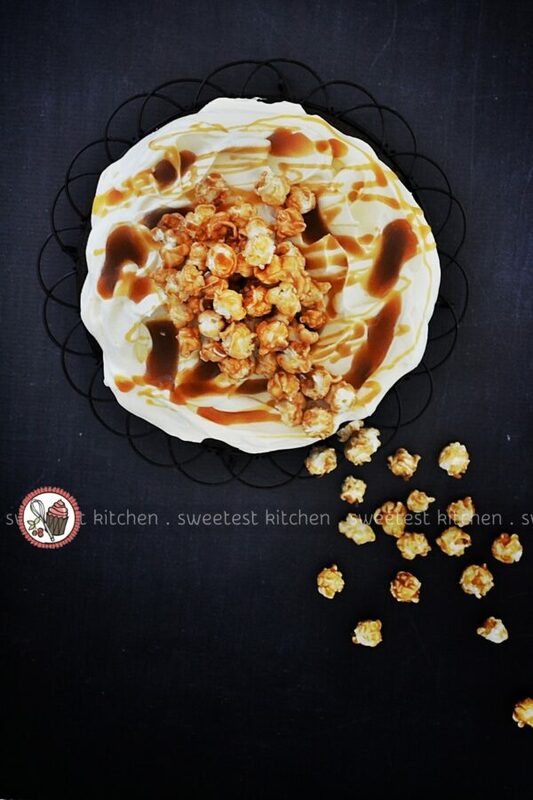 Super easy, one-bowl, fudgy chocolate cake with whipped cream, salted caramel sauce and salted caramel popcorn! This cake is half homemade and half store-bought, making it the perfect cake for a quick dessert or last minute celebration cake. The chocolate cake is my most favorite cake ever (what I’ve called the “Freedom from the Box” cake!). It’s dairy-free, egg-free (meaning you don’t have to wait around while ingredients warm up to room temperature) and made completely in one bowl. It’s the classic wacky cake / crazy cake / dump-it cake / fail-proof cake that you know and love. And if you underbake it, just slightly, it comes out really soft and fudgy. The frosting is a simple homemade whipped cream. You can leave this unsweetened, but I usually add a touch of powdered sugar and vanilla extract. I’ve found that whipped cream is the perfect light frosting for this fudgy cake, by the way. When you spread it on, be sure to leave craters and mountains in the whipped cream – pools of caramel sauce will collect in the craters! For the salted caramel sauce. Of course, you can make your own caramel sauce, but the point of this particular cake is simplicity. So choose a thick, rich and dark golden store-bought salted caramel sauce. You’ll probably need to give it a brief warm-up in the microwave to make it pourable, but be careful not to make it too hot or it’ll melt the whipped cream. If it’s too hot after you warm it up, just set it aside to cool down. The final touch – the popcorn! 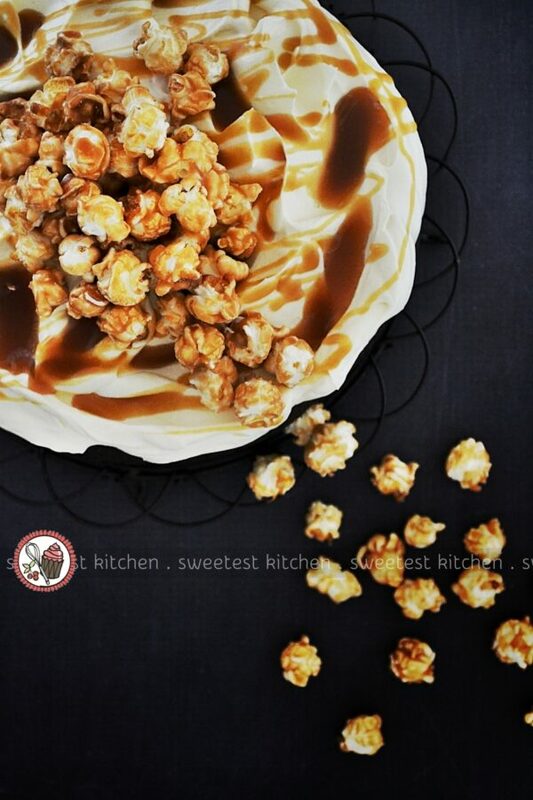 Again, feel free to make your own salted caramel popcorn, but if you’re in a hurry, just buy it at the shops. 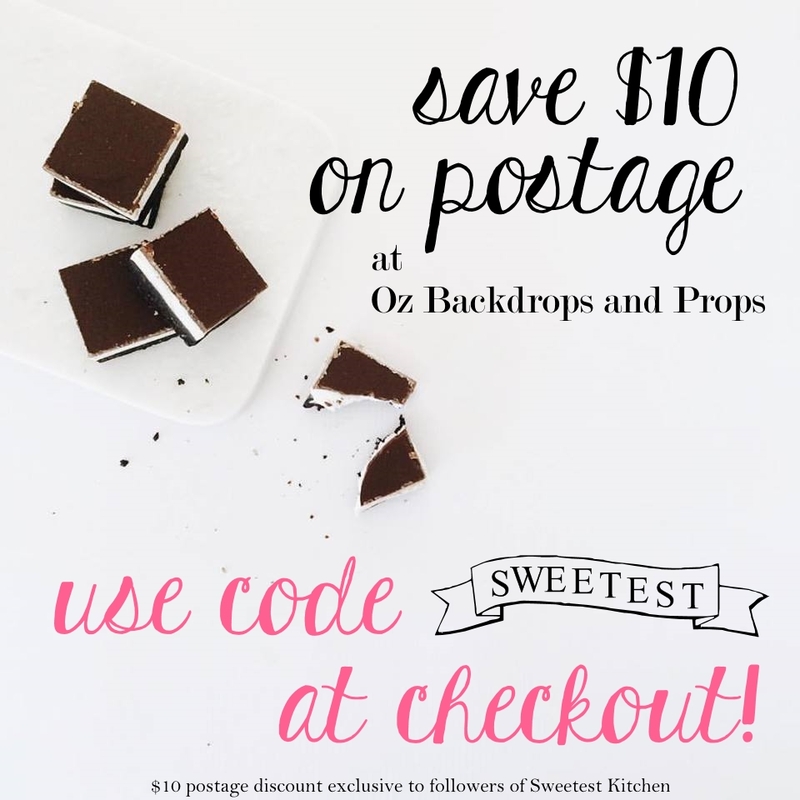 Now pile that popcorn on top of the cake just before you’re ready to serve it, then slice and DIG IN to the simplest, most stunning cake you’ve ever made! Seriously. Look at that. You could have spent all day making this cake. But you didn’t! And it looks fantastic and tastes amazing! Great job, you! 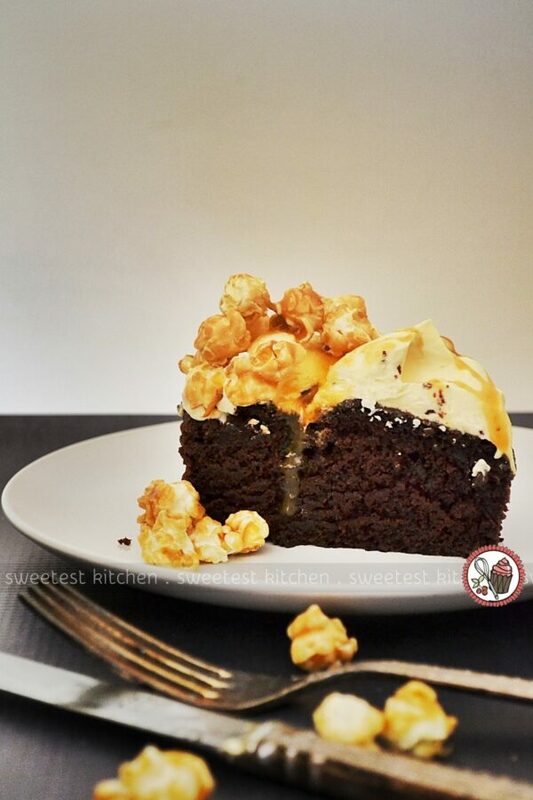 A super easy and quick way to dress up a plain chocolate cake - with whipped cream, caramel sauce and caramel popcorn! Delicious and impressive! Remove cake from the oven, place on a wire rack and cool for 5-10 minutes. Run a knife gently along the edge of the cake around the pan, then carefully turn the pan upside down to remove the cake, and leave to completely cool (right side up) before adding frosting. While the cake is cooling, place a medium bowl and your whisk into the refrigerator to cool for at least 15 minutes. When ready to frost, remove the bowl, whisk and cream from the refrigerator. Place cream, icing sugar, vanilla and food coloring, if using, in the bowl, and whisk (either with a handheld mixer with whisk attachment, electric whisk, or by hand!) just until stiff peaks firm (any longer and the mixture will start looking grainy and curdled, at which time you'll have to start over with a new cup of cream). Immediately spread the whipped cream onto the cooled cake with an offset spatula, leaving craters and mountains in the whipped cream to give it texture and to collect pools of caramel sauce. 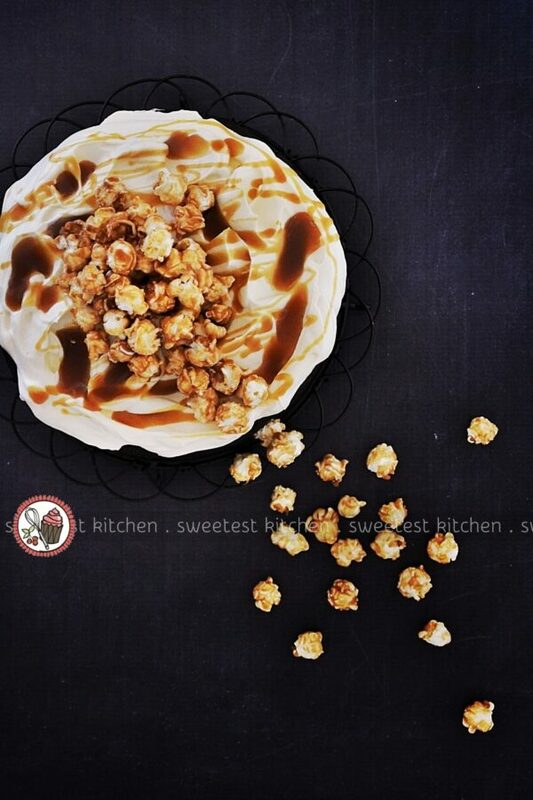 Just before serving, drizzle the caramel sauce over the whipped cream. If needed, briefly warm up the caramel sauce in the microwave to make it easier to pour, but make sure it is room temperature before drizzling it on top of the whipped cream or the whipped cream will melt! Lastly, pile on that popcorn and dig in! 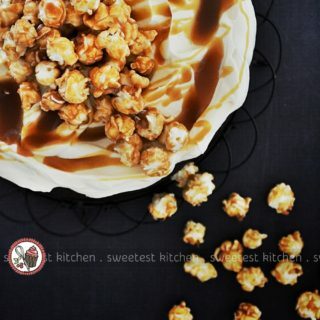 - I used Kettle brand salted caramel popcorn, but you can just use plain caramel popcorn if you can't find salted caramel popcorn. This sounds insanely good! I love that it’s dairy free too.